After Na’il passed away, so many things changed. Suddenly, there was time (and energy) to make short day trips and visit places we had never seen before. More writing opportunities opened up. I began a course “Writing for Children”. And then came a totally unexpected request: to give a presentation about the life of Huram Avi. I was excited and terrified at the same time. But on the other hand, I had written a novel about this Biblical figure, so there was plenty of material available. The only thing I had to do was make an outline, order the material and create a presentation. Being a writer, not a speaker, I didn’t have a clue how much material would be needed to fill 2 hours. For weeks, I made this project my highest priority, and when the whole story began to take shape, I finished it off with power-point slides. And was thrilled with the result. A few days before D-Day, anxiety set in. But then I realized this wasn’t an exam, I could read from the notes, and knew what I was talking about. Peace returned. 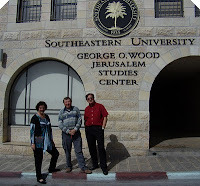 Friday, February 12, 2010, we drove to the beautiful student centre in the centre of Jerusalem. In order to keep an eye on Nadia while I spoke, Wim had taken a day off, and Elsje, our house guest, helped me set everything up. It was so wonderful to see the Dutch leaders of the student group again ~ Paul and Rina van de Laan. After a short introduction from Paul, it was my turn. This was it! Would I be able to find the right English words? Would I stutter, experience a black-out (which often happens when I’m tense)? How would the students respond? God did a miracle on all fronts. I even received a compliment that the lecture was on an academic level (! ); that the idea of an object lesson was so fresh and a wonderful way to dig deeper into the time of the Bible. Paul told the students this was such a good idea to approach a subject. Wow! I was so encouraged, as I’m a self-taught woman, a nurse of profession, with only 4 years of high-school and no academic degrees. What I do have is an insatiable appetite for learning new things, and a love for history. My grandfather and uncles had been teachers, but I always thought that wasn’t for me. However, after this lecture I realized it was so much fun to be able to share and pass on the interesting titbits I had learned and gleaned from years of research. Had Na’il been alive, I would have never been able to take on this project. Then, I had lacked the time and energy to spend on research and sorting of all the material. Then, with Na'il's death, God had closed a door; now, He opened a window, with new opportunities that I never would have thought or dreamt possible. But there was more to come: I’m already invited to give a similar lecture, God willing, next year, in 2011. Writing is a continuing process of honing ones skills. I'm beginning to wonder if I did inherit some 'teaching genes' through my mother. It's another exciting area in which I can learn more and hone my skills. It's such a privilege to use the talents God has given me, and to share them with others! Soli Deo Gloria!